The specter of infidelity and suicide haunts the whimsical hills of his multimillion dollar legacy. Helen Palmer Geisel was attending a dinner party hosted by the Johnstons. As the host hugged her, she turned to him and exclaimed, “You don’t know how I needed that!”. He had suspected her remark was in relation to the increased workload at Beginner Books, a publishing company that she co-founded with her husband, Ted Geisel. Or perhaps, he wondered, there was a more sinister reason. Perhaps her remark was a cry for help, a sign of her increasing loneliness and unhappiness after an almost 40-year marriage that was bound by obligation, rather than love. Two days later, the Geisels’ longtime housekeeper stumbled upon Helen’s dead body in the bedroom of their La Jolla residence. A prescription bottle that originally contained one thousand capsules, was now filled with just seven hundred and six. A letter, directed to her husband, was found near her lifeless body. “I didn’t know whether to kill myself, burn the house down, or just go away and get lost,” it read. The morning after, members of their inner circle gathered around the house to comfort the new widower. Their neighbor and friend, Audrey Stone Dimond, had placed herself in front of the window at the Geisels’ ocean-front property and affixed her gaze into the blurred horizon — perhaps ridden with guilt that their affair, not yet exposed — had contributed to Helen’s untimely demise. Or perhaps she was anticipating the agony that would accompany the accusations of moral corruption that were sure to follow; despite everything, she still loved the man and wanted to be with him. 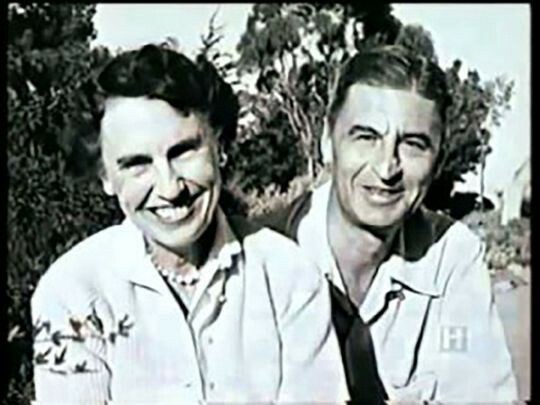 In less than a year, Dimond divorced her husband, sent her children away to boarding school, and did indeed fulfill her utmost desire — Ted Geisel and Audrey Dimond were married. The suicide letter that Helen wrote for Ted had been signed off with their secret code. A make-believe law firm named “Grimalkin, Drouberhannus, Knalbner, and Fepp.” If such a playful and rhythmic bouncing of words sounds familiar, it’s most likely childhood nostalgia resurfacing. Helen was the uncredited and largely unknown writer responsible for nurturing the creation of one of the most influential authors and artists of the 20th century. Theodor Geisel (Dr. Seuss) // World Telegram & Sun photo by Al Ravenna circa 1957. Courtesy of The Library of Congress. A published author herself, she was once widely regarded as his “chief editor, chief critic, business manager and wife.” For interviewers who had an exclusive with Dr. Seuss, their go-to question is why a famous (and married) children’s book author doesn’t have any of his own. “You have ’em, I’ll amuse ‘em,” he quipped in interviews with The New Yorkerand Los Angeles Times — an understandably evasive answer to a perhaps overly personal question. But behind closed doors, in particular in a conversation he had with his niece, Margaretha “Peggy” Dahmen Owens, he dropped the decades-long façade and revealed, “It was not that we didn’t want to have children. That wasn’t it.” In The 500 Hats of Bartholomew Cubbins, the entire book was dedicated to a seven-and-a-half year-old named Chrysanthemum-Pearl. For years the name of Chrysanthemum-Pearl had appeared on the Geisel Christmas cards, but then so had Norval, Wally, Wickersham, Thnud and a dozen other fictional infant-like characters. In a conversation between close family members, it was revealed that in the fourth year of their marriage, Helen had been hospitalized in New York due to worsening abdominal pain. The doctors couldn’t diagnose the underlying cause and thus made the swift decision to remove her ovaries, rendering her incapable of ever having her own children; she was thirty-three years old. Peggy Owen’s son — named Ted after her famous uncle — recently shared his mother’s favorite photograph of Helen with me. Her deep chestnut brown hair is delicately curled in bunches, bordering her warm, softly featured canvas. Her pale blue eyes offer an agreeable gaze, flanked by an authentic, radiant, all-teeth-showing smile — the sweetness intensified by the red hue of her lipstick. To say that Helen was like a mother to Peggy is an understatement. Peggy’s own biological mother had died when she was only seventeen years old, and the Geisels had welcomed her into their home when she first moved to California. Two years before Helen’s death, Dr. Seuss had dedicated the book, I Had Trouble Getting To Solla Sollew, to her with the inscription, “For Margaretha Dahmen Owens, with love and thanks,” as a token of appreciation for her staying with them while his wife was ill. Helen had struggled for more than a decade with partial paralysis fromGuillain-Barre syndrome, a rare autoimmune disorder where the immune system attacks your healthy cells, which leads to weakness, numbness and tingling. Before her health had deteriorated, Helen was a talented writer and businesswoman. She graduated from Wellesley College with honors in 1920 and thrived in an environment where the curriculum was focused on languages, literature, and even economics. After graduation, she enrolled in Oxford University, an institution that awarded women degrees for the first time only four years prior to her arrival. Unbeknownst to either of them, Ted Geisel was to also attend Oxford after he graduated from Dartmouth. In 1925, a young American girl sitting behind a doodling Ted peered over his shoulder and was surprised to see how little he was paying attention to the professor. After being in several lectures with this student, she concluded that he always just seemed to be immersed in his own little world. A year earlier, she had arrived at Oxford with her widowed mother. Standing at five foot three inches, Helen Marion Palmer, Ted recalls Helen possessing a “certain grace” that was distinctly unique to the other women at Oxford. One day, as she watched Ted illustrate John Milton’s Paradise Lost, she insisted he was on the wrong career path. “What you really want to do is draw”, she said. Her judgment solidified by glancing at another one of his pages, “That’s a very fine flying cow!” University of Cincinnati graduate, Joseph Sagmaster, was also attending Oxford and had introduced the pair having known the both of them personally. Years later, Ted Geisel would dedicate the book Yertle the Tertle to his friend; legend goes that this honor was perhaps bestowed upon Sagmaster because he introduced Geisel to Helen back at Oxford. Sagmaster himself said this was, “the happiest inspiration that he had ever had.” Their swift romance had all the trappings of Ted’s impulsive nature, with a sharp dash reminiscent of an old Hollywood film. After racing back to Oxford before curfew, Ted proposed to Helen in a roadside ditch after he had taken too wide of a turn on their two-horsepower motorcycle and had accidentally toppled them over. “So, we became engaged,” Ted said, but for a time it was their secret. 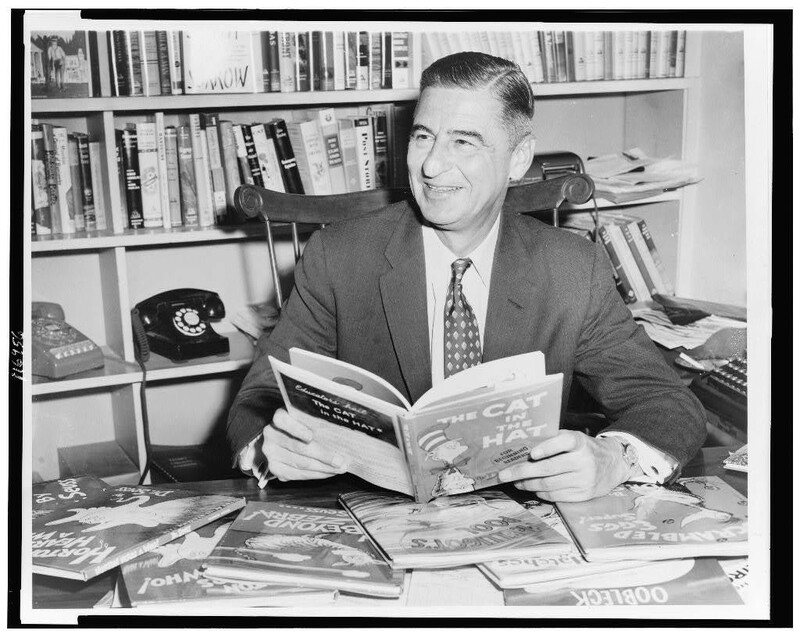 Geisel granted his first Saturday Evening Post interview with Robert Cahn, revealing why he became Dr. Seuss, the simple reason he draws the way he does, and the undeniable effect his wife, Helen, has had on his career. Two years ago, a republished article from 1957 had appeared, in which Cahn wrote how the famous author “depends at all times on the level headedness of his wife, Helen” to pull him out of predicaments where his impulse has inevitably led him. Separately, Ted’s sister Marnie had always talked of how Helen had been “a great help to him in his work”. Helen and Ted married in 1927. Photo courtesy of Kenneth A. Schade. Around the beginning of 1957, Ted had trouble finishing his Christmas-themed book. In a bid to protest commercialization, the Grinch plotted the sinister mission in destroying any gifts, ornaments, trees and fixings that the Whos had planned for their beloved annual holiday. Then arrived the stumbling block. He wondered how he could wrap it up without injecting a pathetically sentimental ending. Later that fall, How The Grinch Stole Christmas was published. Seventeen years earlier, he had struggled with another book, Horton Hatches The Egg. At the time, the Geisels were living on Park Avenue in New York City. As Germany began to occupy France, progress on the book was immediately put on hold. Instead, Ted began sketching brutal images of Adolf Hitler, and the benign elephant affectionately named Horton, was momentarily consigned to oblivion. 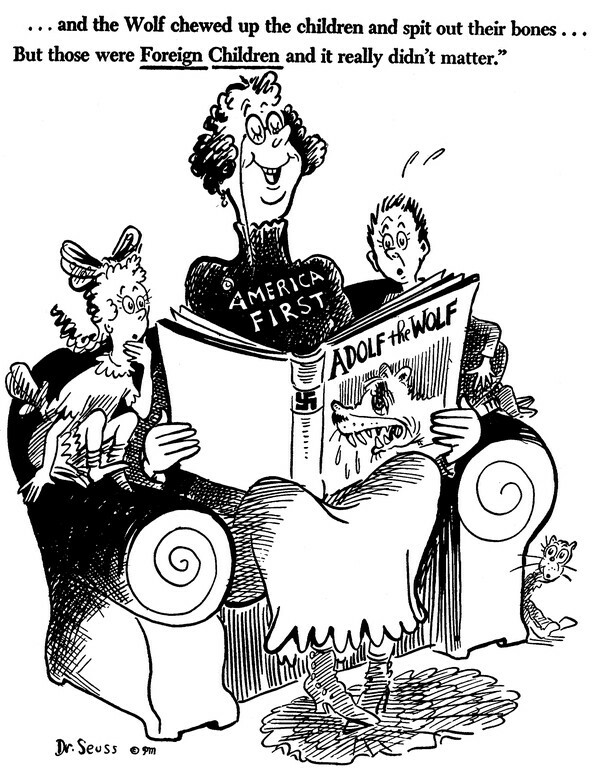 The sudden priority shift didn’t seem to bother Ted, who was quoted as saying, “I didn’t know how to end the book anyway, so I began drawing savage cartoons.” He continued, “I had no great causes or interest in social issues until Hitler.” The conception had originated from an earlier sketch that Geisel had drawn which superimposed an elephant over the branches of a small tree. He then spent countless days trying to figure out how Horton could have entangled himself in such a way. At that point, Helen swooped in with her creative wit and began brainstorming ways to bring Horton down. In Ted’s words, her pivotal contribution was in the climactic lines that follow the hatching of the egg on which Horton sat on for 51 weeks. Then, suddenly, in an epiphany-like state, Helen and Ted cheered, and cheered and cheered some more. Her husband agreed and also remarked at his own disbelief surrounding the conclusion, especially considering the absence of forethought during the writing process. “Ninety percent of failures in children’s books come from writing to preconceptions of what kids like. When I’m writing a book, I do it to please Helen and me. But when it finally comes out, I take one look and think, ‘Oh, my God!’” As with most successful writers, Ted was eventually approached by Hollywood. 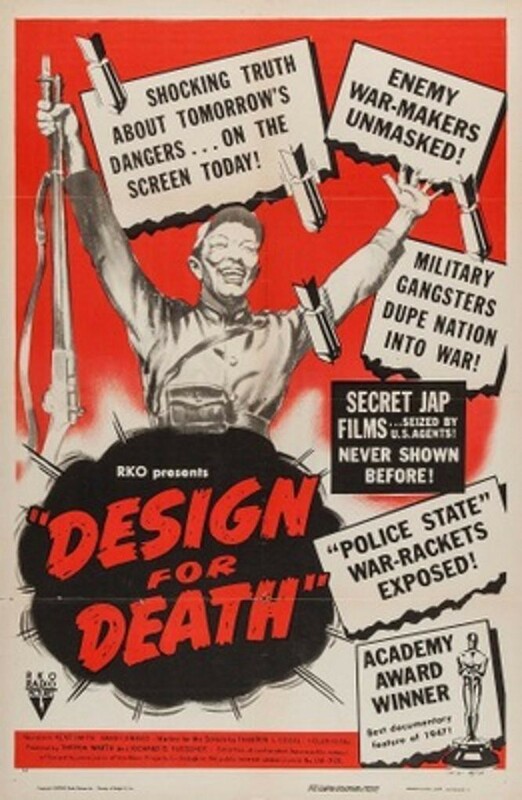 For first-time screenwriters Helen and Ted Geisel, their synergistic collaboration had materialized into an original screenplay titled Design for Death, which chronicled the events leading to Pearl Harbor. It went on to win the 1947 Academy Award for Best Feature-Length Documentary. However, despite their well-deserved high-caliber Hollywood accolade that many spend years trying to obtain, they were driven away by “disillusionment with the film industry” and instead proceeded to make The Tower in La Jolla their permanent home. 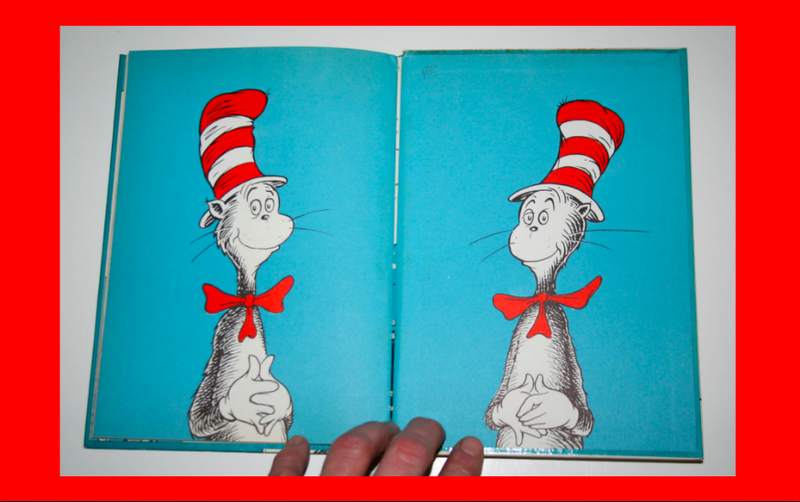 The Cat In The Hat was published through the company they co-founded with Phyllis Cerf at Beginner Books (an imprint of Random House). Helen had, perhaps in an act of defiant independence, used her maiden name to publish numerous titles under the Beginner Book banner over the years, including A Fish Out Of Water, I Was Kissed By A Seal At the Zoo, Do You Know What I’m Going To Do Next Saturday? and Why I Built The Boogle House. Perhaps the posthumous and rapid consumption of these works represents a greater human condition: that we, despite modern society favoring atomization and individualization, have an embedded desire to commemorate a person or a group of people who symbolizes a positive impact on the wider community, expressed through groundbreaking contributions in the arts, humanities or sciences. Conversely, it can be safely said that most, if not all humans, have an intent to leave a similar mark when our inevitable mortality arrives. Five miles south, at the Museum of Contemporary Art San Diego, lies a small library embedded in its white-walled corridors and in plain black text it reads, “Helen Palmer Geisel Library.” Much like her own demeanor, the space is unassuming, subdued and notably humble. A lack of online search results questioned its existence, but the Communications and Marketing Manager at the Museum had affirmed that there was indeed a small library dedicated to her. No other information could be found pertaining to the library’s namesake. Helen’s work and her contributions to the creation of Dr. Seuss couldn’t be efficiently exploited through marketing campaigns after her death. Not only was Helen’s death swept under the rug, but that feat could have only been made possible if she publicly claimed title to his revolutionary success, which she never did. Years earlier, with a keen observation over a young Ted Geisel, she nurtured and fostered a man with an undeniable talent that was yet unbeknownst to anyone else but her. When evidence of his potential came to light to the young married couple, she had effectively made her life legacy about choice, sacrifice and unconditional love. Contrary to conventional wisdom, the choice to stand by her husband’s career and fade into the background was not an easy one. Dr. Seuss Enterprises has been successfully running their multi-million-dollar global portfolio almost 30 years after the beloved author’s death, thanks in part to his second wife, Audrey Geisel, who passed away this year. She was known for her stringent control of licensing partnerships and fierce protection over their intellectual property. Her unrelenting clutch of some of Ted and Helen’s work — coupled with expertly tailored marketing and public relation campaigns — assisted in a generally accepted wholesome and sunny legacy of the famous children’s book author. It’s only in recent years that his sordid minstrel past has unsurfaced and Geisel’s work has come under fire for racist cartoon depictions. But even with his arguably sordid personal life and problematic societal stances, his legend and life remain largely unsullied and the Dr. Seuss juggernaut rolls along, celebrated year after year, bookshelf by bookshelf. And that’s in no small part to the sacrifices of Helen Palmer Geisel; her contributions have affected the lives of millions of people all over the world, and have sprawled across three generations.